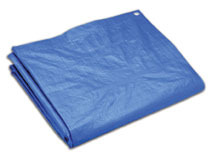 PRODUCT: 100' X 100' BLUE POLY TARPS, 8x8 WEAVE, ECONOMY GRADE 2.3 OZ. 1 TARP. PRICE/EACH. (heavy item, truck shipment only).